THQ is under investigation for making "materially false and misleading" statements about its business in 2011 and 2012. Few things will spur the universe to prove that things can always get worse than saying that things can't possibly get worse. 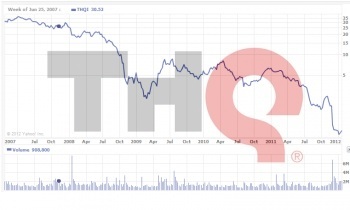 Case in point: THQ, the beleaguered game publisher that's seen its share price plummet from over $36 in 2007 to about 64 cents today. It's facing a Nasdaq delisting, was forced to change its Warhammer MMO to a single-player game, has laid off staff, dropped franchises and closed entire studios, and while I don't know if all that and more ever made CEO Brian Farrell say, "Wow, this just cannot possibly get any worse," if he did, then he was wrong. Holzer Holzer & Fistel LLC, "a complex litigation boutique that represents investors victimized by securities fraud and other corporate corruption," announced today that it has launched an investigation into "potential violations of federal securities laws by THQ." "The investigation focuses on whether a series of statements made between May 3, 2011 and February 3, 2012, inclusive, regarding the Company's business, its prospects and its operations were materially false and misleading at the time they were made," the firm said in a statement. "Specifically, the investigation seeks to determine, among other things, whether the Company knew but failed to timely disclose that demand for its uDraw GameTablet was below internal expectations in part due to differences between gamers who play video games on the Nintendo Wii and those who play games on Xbox360 and PlayStation." The sticky part is that THQ had presented the future expansion of its uDraw tablet to the Xbox 360 and PlayStation 3 as a big source of revenue growth, but then on February 3 announced that the manufacture and sale of uDraw was being canceled because of disastrously poor sales. I don't know exactly how federal U.S. securities law works, but I suspect that if THQ knew, or had a pretty good inkling, that uDraw was going to tank but continued to pimp it to investors as the Next Big Thing anyway, it's probably in violation of something. How the investigation will be undertaken or what sort of hammer will fall if it turns out that THQ was cooking the book isn't clear, but if you happened to purchase common stock in the company at any time during the period under scrutiny - May 3, 2011 to February 3, 2012 - and "have questions concerning your legal rights," the company encourages you to drop a dime.